I could live on pumpkin this time of year. Actually, I could live on pumpkin all year long, but there aren’t many pumpkins available in this part of Texas once November ends. Also, though…I think I like gorging on pumpkin this time of year because I associate it with fall. There’s something about pumpkin, especially pumpkin pie, that just makes me feel so happy. I will never deny myself pumpkin pie on Thanksgiving (or, umm, any time it’s around?). But I do try to avoid all the sugary junk often associated with my beloved gourd of choice. Pumpkin cream cheese rolls, I’m talking to you. 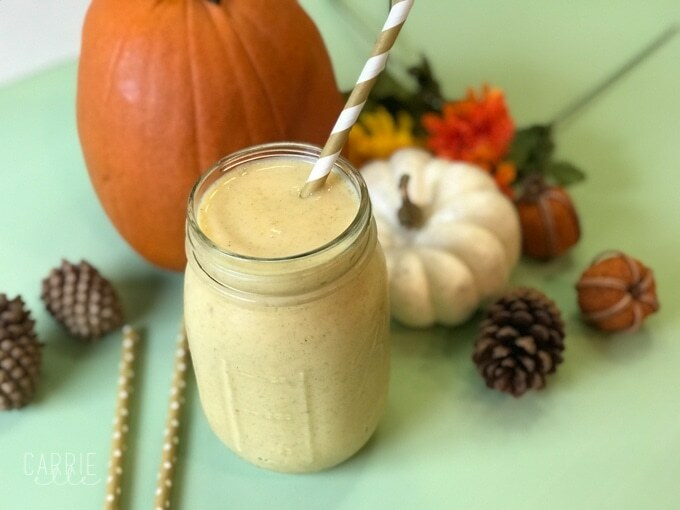 But I’m avoiding the drive-through line when I get a pumpkin craving this year, and this 21 Day Fix pumpkin pie shake is the perfect alternative. Let me be honest. There’s no ice cream in this one (waaaaaah!). But it’s still pretty fantastic. There are a couple of modifcations you could easily make to this recipe. First, I used Greek yogurt. You probably know it’s pretty tangy. Add another teaspoon of honey to make it even sweeter, or replace it entirely with vanilla protein powder. You could also add protein powder and double up the red containers! I feel like it won’t be as delicious, but sometimes eating well means we have to eat protein powder. Sad face. I always add spinach to my shakes, but I wanted this one to be pretty for pictures, so I didn’t. Spinach will make the color a little funny, but won’t alter the taste. Toss in a handful of spinach to get those greens in! Toss all ingredients into a blender and blend until creamy. Garnish with cinnamon (which I clearly forgot to do, ha). Enjoy! Put all ingredients in your blender and blend until smooth. Garnish with cinnamon. Enjoy! Add spinach to get your greens in. You can also add protein powder for even more protein. The 21 Day Fix program is always changing, and while I do my very best and never want to mess up (perfectionist, yo) please always double check the container counts yourself…and that goes for all recipes, not just mine – I’ve seen some super shady ones out there! I think you’ll also love the recipes below – click on the picture to get to the recipe. Happy eating!